These truffles are simply divine. Homemade, rich in chocolate and coffee flavour are much better than those available in supermarkets. They are also lower in carbohydrates and served with nice coffee make a special treat for diabetics. I don’t recommend to have them all at once (with carbs you would be kind of ok but with calories a bit less!). You can refrigerate them in an airtight container for up to two weeks. I didn’t add any extra sweetener as they were sweet enough for me but if you like add a bit of splenda or stevia. 1. In a bowl over simmering water melt the chocolate. Leave the mixture to cool to room temperature. 3. Using electric mixer blend mascarpone cheese slightly (just for a few seconds) and add coffee and cocoa mixture and melted chocolate. Mix for few more seconds. 4. Fold in ground almond to get a smooth texture. 5. Put the mixture in a fridge for about an hour. 7. Sift in cocoa powder in a large bowl. 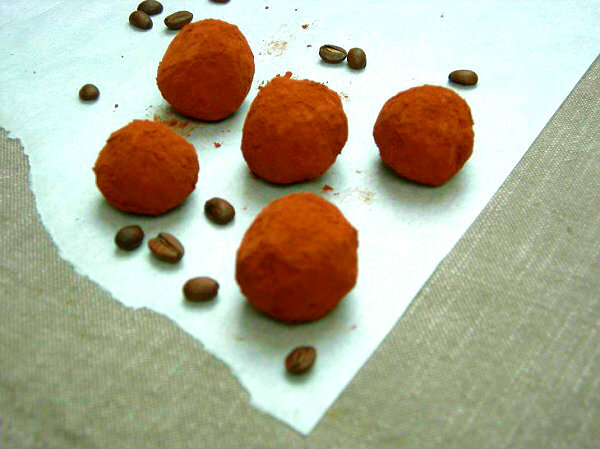 Place 3 or 4 truffles at the time in a bowl and shake it so the truffles get nicely covered with cocoa powder. 8. Put in a fridge for about 10 minutes.